It was remarkable that on the front page of yesterday’sCape Times, beneath a picture of a quelled township riot, the headline printed in large bold font announced: “Disgraced Aussies kicked out. ” TheCape Arguswas barely less coruscating: “Guilty trio on first flight home.” The words might as well have had an exclamation mark after them. If you didn’t know better, the immediate assumption would be that drug-trafficking, manslaughter or some such terrible crime was the reason. But no, it is ball-tampering. There but for the grace of God goes many a cricketer. Since the open discovery of reverse swing, cricketers the world over have experimented with myriad ways to make an old ball swing. In 1990 in Southampton, Hampshire played Surrey. Each morning Waqar Younis showed players from both teams the method, and then during the day, paraded his skill. The ball moved for us all, late enough to be relevant but not at a pace to trouble anyone who could bat. That searing pace and the lower slinging arm were Waqar’s exclusive gifts and his skill was to put the two together. Hampshire were cruising at 70-odd for one, after which Waqar took six wickets, including four with the old ball in the blink of an eye. He caught us unaware at the time but we came to rather admire his genius. Indeed, for the decade that followed, Waqar and Wasim Akram led the way in a priceless and riveting art form that, though not without its controversies, gave cricket a fascinating new option. Not for one minute does anyone in or around the game at its higher levels think that reverse swing comes only from natural causes. More often than not, it is helped along its way by the hands of those who practise it, or of those who prepare the ball for those who practise it. It is a fact of the game. My own view has long been that once a new ball has been given to the captain, his team should be left to get on with it – saliva, fingernails, the lot, which, incidentally, includes bouncing the ball in from the outfield. After which, the ball should not be changed for any reason other than if it is a “rogue”, as defined by the eye of the umpires and the gauge they carry with them to the middle. The only rule about reverse swing that should matter is the one that says a foreign object may not be used to change the condition of the ball. And that, of course, is the rule the Australians broke. The stupidity beggars belief. Thirty-plus cameras cover a Test match, along with a collection of commentators who have played and understand the game. To follow such naivety with a lie is just incomprehensible. That Cameron Bancroft was all but coerced is pretty nasty, and that Steven Smith referred to his leadership group as the schemers is feeble. And yet for all of this, I do not see it as a hanging offence. Clearly the captaincy had to go, and equally clearly the vice-captaincy. The punishment that has followed has been extremely severe, and I cannot help but think of Smith and Bancroft. We have been told they were distraught, and have seen how distraught Smith has been facing the media in Australia. We should all be careful not to throw stones. These young men will be in the darkest place. Vilification is almost certain, but is it right? The real challenge will be to find them some light. First up, they will be marked as cheats, and there is not much, outside of criminal charges, that is worse than that. But aren’t we all cheats in our way? If we have edged the ball and not walked, are we not cheating both umpire and opponent? If we claim a catch on the bounce, we are surely cheating! If we interrupt the concentration of an opponent, are we not cheating him? If we sledge or look to “mentally disintegrate”, are we not looking to gain unfair advantage outside the parameters of the game’s accepted rhythm? And if we personally abuse an opponent? Well, enough said. Which takes us to David Warner, who has been unable to fly beneath the radar at any time during his career. Warner is the attack dog. It is a position that lights the fire in his stomach, fuels the engine of his batting, and determines the confrontation of his day. It also turns people against him, a mood that will not have bothered him in the slightest until now. The extent of it, that is. For all the ball-tampering madness, we can also see a team both out of touch and out of favor, and a vice-captain a million miles away from understanding what the game of cricket truly means to millions of people around the world. This is odd, because when his friend Phillip Hughes lost his life, Warner appeared to take it hard. The global fallout was extraordinary and gave pointers to the emotion associated with cricket, and the love. The game lost one of its own, and thus, love was lost. In these pages at the time, Martin Crowe wrote a typically wise piece. Could Warner not hear these words and see their signals? It seems not, which is the most terrible shame, for he is a rare talent now on ice. The lessons from his year out of the spotlight, whether learnt or not, might well go on to define him. For a while now, I have wondered about the spirit of the game, surely its greatest strength. There has been a lot of anger out there and an increasing amount of greed. The good guys are as good as they ever were but the less good have a loud voice, some of them in important positions of power. Everybody should read, or listen to, Brendon McCullum’s compelling 2016 MCC Spirit of Cricket Lecture. In it, he says, “Cricket was meant to be a game not a life-or-death struggle”, and he explains the root of an ethos that is at the heart of cricket’s enduring appeal. Again, these words have been edited. It was so strange, and yet it felt so right, that after Phil’s death we didn’t really care any more about the result. Because nothing we could or couldn’t do on the field really mattered in comparison to what had happened to Phil. 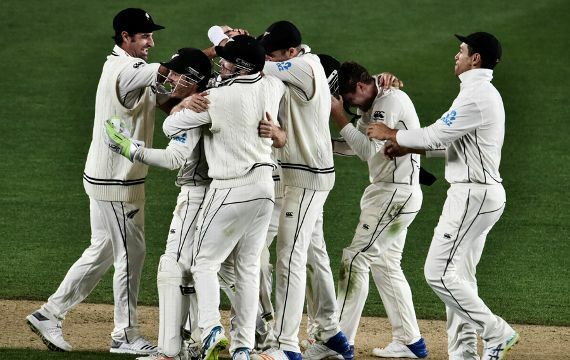 Our perspective changed completely for the rest of my time playing Test cricket for New Zealand and we were a much better side as a result. Right there is the spirit of cricket. Within the thoughts of these two fine New Zealanders is the root of a problem that Smith cannot possibly have predicted. He broke the rules from a weak position. After the Ashes; after his consecutive anni mirabiles; after comparisons with Bradman; and after contracts that only Hollywood, Bollywood and Virat Kohli could begin to imagine, he assumed a strong position. But no, his position was weak. The team he led had brickbats thrown at it every bit as often as bouquets, and on a personal level, he was made weaker still by the unforgiving nature of his, and Warner’s, part in the contract dispute with Cricket Australia. He may or may not have been right on that one but people sniffed spoilt cricketers grabbing at more. Probably he thought himself invincible, and if not, then indispensable. He too has a year to contemplate, and top of his subject list might well be the way in which cricket imitates life. During this time he will surely add maturity to that generally sparky disposition. It would be good to see him back, twitching around that crease once more and driving bowlers to distraction. Meanwhile the vultures have had their feed and there is little left of the carcass that just days ago had Smith and Warner at its core. The game had hoped that the loss of Hughes would bring about kinder, perhaps gentler, attitudes. We are three and a half years on and the chance is there once more.